How do you play two whole notes next two each other? They're not stacked on top of each other but rather one is slightly right of the first. It's in 4 4 time and so that means 1 whole note should take the entire bar. So when should I play the second whole note? These two notes are just one chord with 2 notes. You should play them simultaneously. And in the next bar you hold the Sol, and change the Fa to Mi. It's not the same chord in that bar. They are not the same two notes both times; both bars have the G, but the F is in the first bar and E is in the second bar. This may be what is throwing you off. To answer your question, you play the F and G at the same time, as a chord. The reason they are not stacked vertically is that they would overlap and be more difficult to read. In reference to the tie, you would hold down the G note over both bars, and change from F to E in the second bar. This is a two voice part, the note G in the upper voice is actually a double whole note (or a "brevis"- breve am.) of 8 beats. In a 4/4 measure it can't be notated otherwise than 2 tied whole notes. 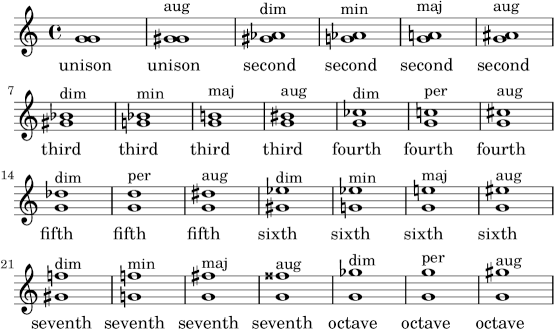 The second voice is containing 2 whole notes (semi brevis) each of 4 beats. In music, a double whole note (American), breve (international), or double note (Baker 1895, 133; Burrowes 1874, 41) is a note lasting two times as long as a whole note (or semibreve). ... In "perfect" rhythmic mode, the brevis was a third of a longa, or in "imperfect" mode, half a longa (Hoppin 1978,). So they obviously have to be played on the first beat of the measure - otherwise they wouldn't fit together in two bars. How do you identify whole-step and half-step between notes on sheet music?